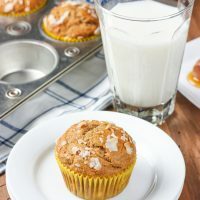 Light, fluffy and flavorful, these Peanut Butter Banana Protein Muffins are refined sugar free and whole wheat! They’re easy to make and are a great snack or breakfast-on-the-go! *This post has been sponsored by Kemps. All thoughts and opinions are my own. All of the illnesses floating around lately seem to have hit us hard! Has your family been suffering? At least one of us has been sick for quite awhile, and while that has disturbed work schedules and other commitments, it’s also messed up our workout schedules. It’s been hard to slowly ease back into a regular workout routine when we’ve been so drained and exhausted. I think we’re finally on the upswing, and we’re slowly getting back into a better workout and eating schedule. We frequently have milk in some form after a workout. Sometimes it’s just a plain glass of milk. 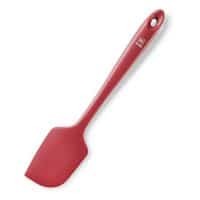 Other times we use it in a smoothie or protein shake. And sometimes we have a glass of milk with a protein muffin that has milk in it! 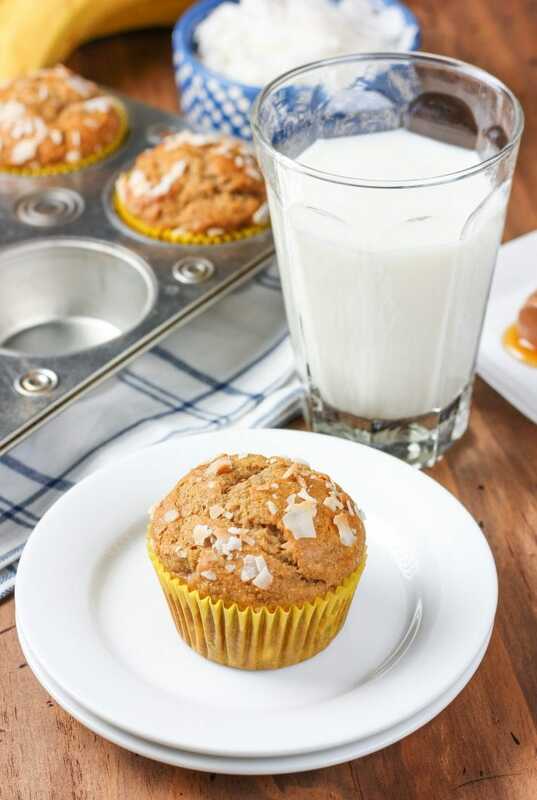 These muffins were made with the new Kemps® Probiotic Milk (found only in MN and WI). I grew up drinking Kemps milk and love the fact that it’s produced locally in Rochester, MN, fresh from local family farms. I was able to pick up a half gallon at Coborn’s in the dairy section. I went with the 2% Reduced Fat version, but there’s also a fat free skim variety available! 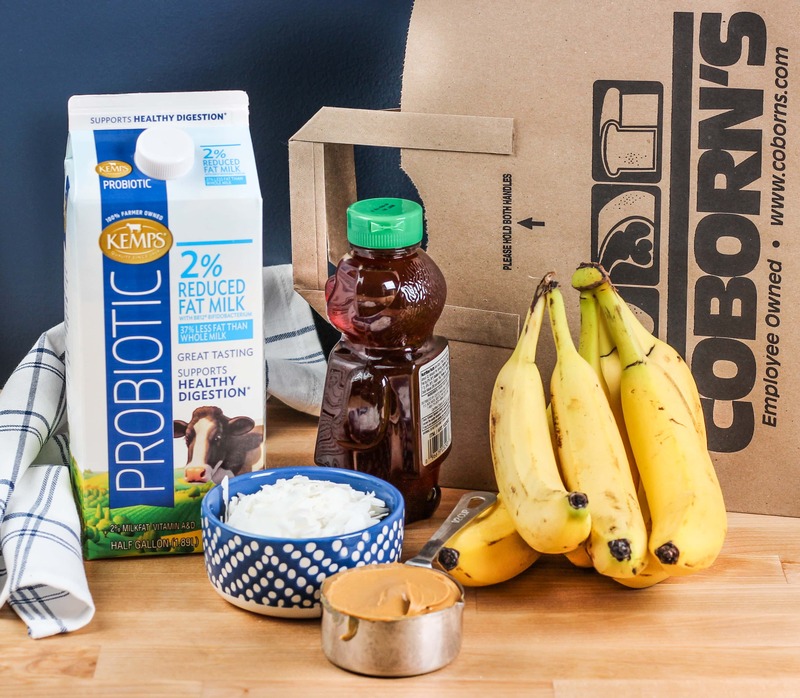 This probiotic milk has all the benefits of milk along with probiotic cultures used in yogurt that includes both acidophilus and bifidus to support digestive health. Drink one 8 ounce glass daily to support healthy digestion! We like that we get the added benefits without noticing a change in taste. Just use it how you would normally use milk! For us, it’s easy to swap out one serving of milk a day with Kemps Probiotic milk by either switching it out in a post-workout smoothie or as a glass alongside a snack. 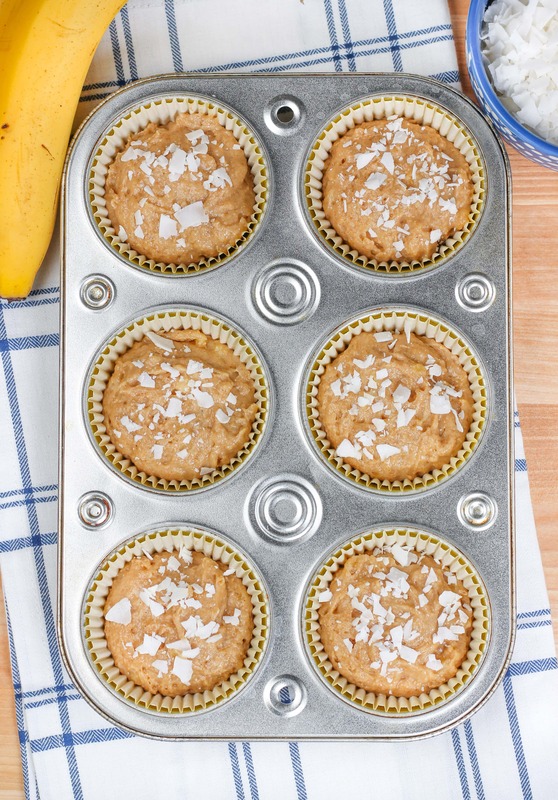 Preferably a glass alongside one of these peanut butter banana protein muffins! We’ve been making some form of these muffins for years, and we don’t plan to stop anytime soon. They are easy, portable, and make a great breakfast or snack. 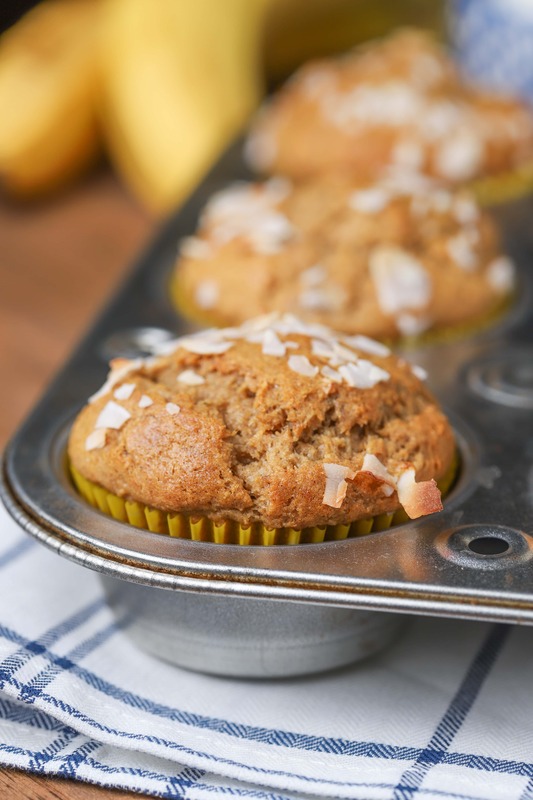 These muffins started out as just peanut butter banana muffins made with butter and sugar, but over time, these muffins have morphed into whole wheat refined sugar free muffins made with coconut oil and protein powder! And you know what? We love this version the most! They have a light, fluffy texture that isn’t oily or heavy. 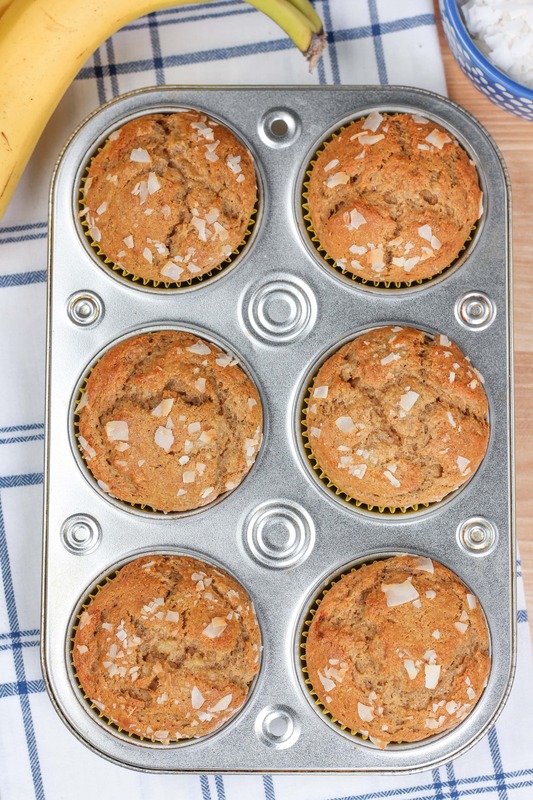 The peanut butter banana flavor shines through, and you can’t tell that they’re made with white whole wheat flour! We love grabbing a couple for a quick post-workout snack to tide us over until dinner is ready. They also make an easy, portable breakfast for those busy mornings when you’re rushing out the door! Grab a glass of Kemps Probiotic Milk, and enjoy! 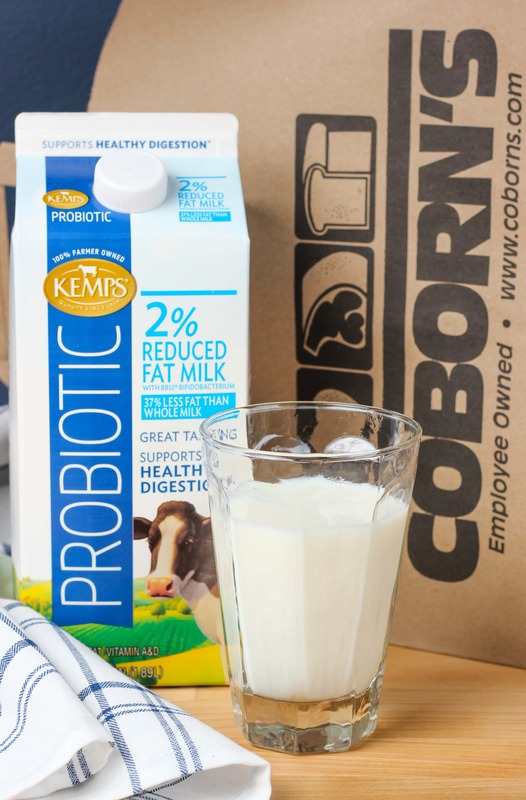 *Not all milk consumption should be replaced with the Kemps Probiotic milk product if you consume several servings a day. Preheat oven to 375. 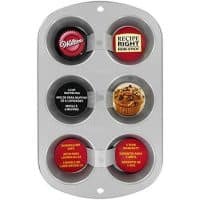 Line muffin tin with cupcake liners or spray tin with non-stick cooking spray. 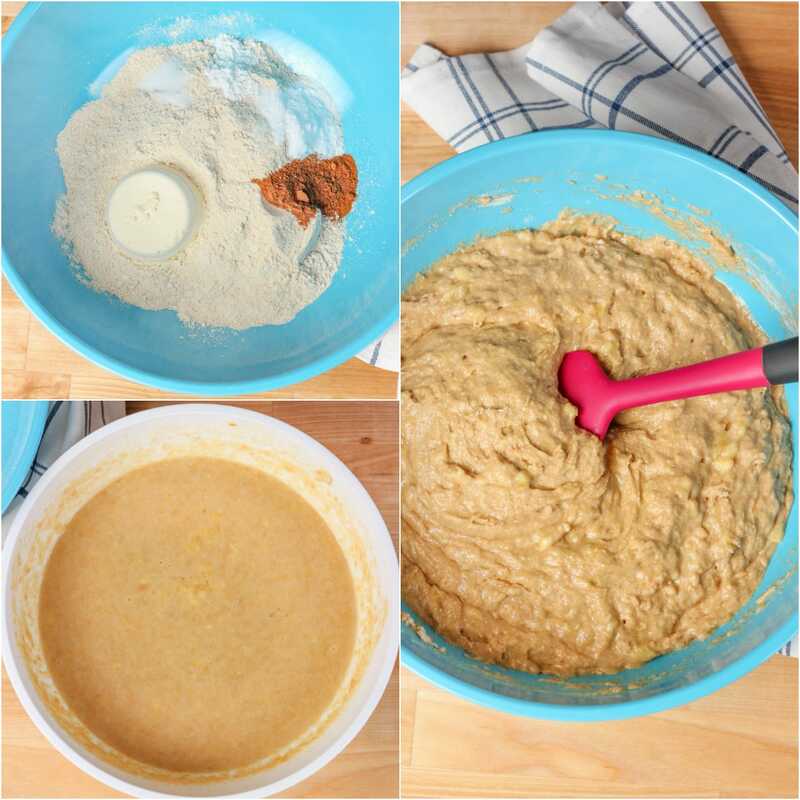 In a large bowl, whisk together flour, protein powder, baking soda, cinnamon, baking powder, and salt. Set aside. In a separate large bowl, whisk together mashed bananas, peanut butter, honey, coconut oil, and eggs until well-combined. Carefully stir in milk. Add wet ingredients to dry ingredients and stir until just combined. Pour batter into muffin tin, filling each cup about ¾ full. Sprinkle tops with flaked coconut. Bake for 15-20 minutes or until toothpick inserted in the center comes out clean. Remove to a wire rack to cool. Store leftovers in an airtight container. These look wonderful. My daughter loves muffins for breakfast, which are basically cake!! These look like a much better, and still delicious option!!! These look like a perfect breakfast option (or dessert or snack). I love healthier muffins! Perfect for breakfast! Made these yesterday and they are amazing! I had some coconut honey which added a nice flavor. Sadly I didn’t have the coconut flakes like I thought so I chopped up a dark chocolate espresso bar and threw that in. I’ve got a relay race later this summer and will be making these again for the ride. These came out super soft and fluffy. 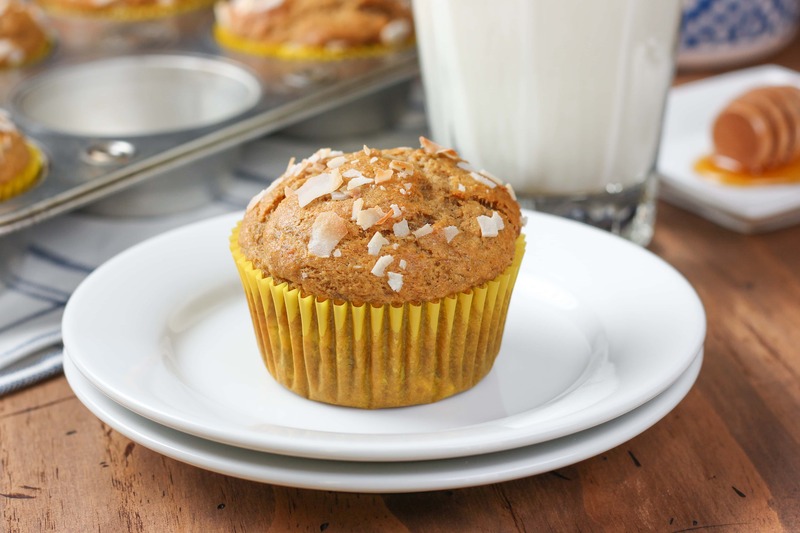 I love how it packs great ingredients into an easy grab and go healthy muffin! 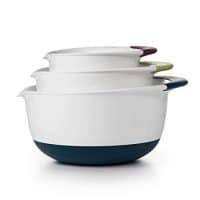 I substituted olive oil instead of coconut oil and added pecans instead of the coconut flakes. The family loved it! This recipe is a keeper! Just made these!! They are AMAZING! So moist and perfectly sweet. I did change up the recipe a little— I used the isopure banana protein (has no carbs), almond flour instead of wheat flour, hazelnut milk and just a drizzle of honey (the protein powder & hazelnut milk are already sweet). I love sweets but I recently started my diet so I eas looking for options and I gotta say, this one’s a keeper. Thank you soo much!! Can’t wait to share these with my coworkers tomorrow! 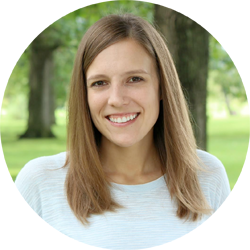 Probiotic milk is useless in a muffin that is baked- my two cents.